It is that wonderful time of the year when the locals buy their concert tickets and look forward to a winter season of music. This year is special. Since the Venables Auditorium burned down we’ve designed programs especially suited to the acoustics and intimate temporary setting we use at the Oliver Alliance Church. This season will start there but we are hoping against hope that the fabulous new Venables Theatre will be complete and we can end the season with a show featuring Ken Lavigne, the Victoria tenor with “a voice of liquid gold” who took his dream to Carnegie Hall and came home with 3 standing ovations at the Big Apple. He will be joined on stage by his band (piano, guitar, bass, drums and violin). Ken has charmed his way into the hearts of this audience with his sincere delivery of ballads, show tunes and classical crossover hits in the style of Andrea Bocelli and Josh Groban. Some of you may remember him singing in the old Venables auditorium one rainy night when the roof was leaking and raindrops really did fall on his head. Won’t it be grand to hear the pure lyric sound of his voice in our new theatre on February 28th, 2014? For those impatient to find out how to get tickets, here is the scoop. Four admission flex pass tickets for only $60 are already on sale for the concert series at Beyond Bliss in Oliver, and Imperial Office Pro in Osoyoos or at the door. As usual, the flex ticket can be used in any combination. Four can go to one concert, snow birds can share a ticket or one person can come to all 4 concerts. A single entrance is $20. Those students 17 and under gain admission free and those needing a ride from Osoyoos can call Maureen at 495 7978 and arrange to come by bus. All concerts start at 7:30 pm. But I get ahead of myself. The South Okanagan Concert Society executive are really thrilled to announce our first concert on Friday, November 8th. 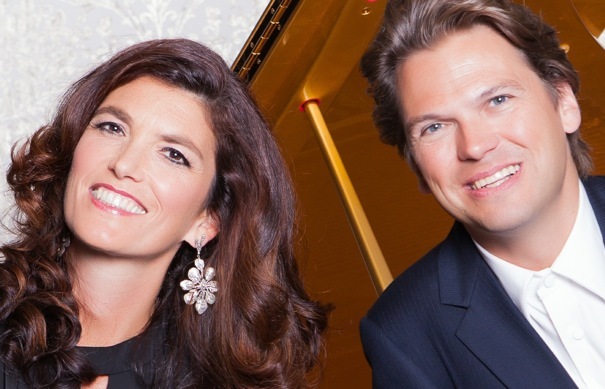 Two matching grand pianos, four hands, 176 keys and the Bergmann Piano Duo (pictured above) is set to inspire and touch the audience with a dynamic and energetic performance. “Always adventurous, this married couple combines virtuotic dedication with the instincts of professional entertainers who love their music.” The local concert will include works from Mozart, Haydn, Bernstein, Brubeck and Piazzola and will showcase Marcel Bergmann’s unique arrangements as he straddles the best of the classical and jazz worlds. What else is in store for you? On Friday, November 22nd the internationally renowned 12 voice conductor-less choir, Musica Intima, is sure to provide some exquisite, breathtaking, gorgeous choral moments. Known for their warm and engaging stage presence, impeccable musicianship and unique perspective on ensemble singing, Musica Intima has earned a reputation as Canada’s most exciting vocal ensemble. In performance, they engage the audience with a spontaneity and directness all their own. This year the choir celebrates its 20th anniversary ! The South Okanagan Concert Society invites each and every one of you to get your tickets and join us for the 2013-2014 concert series so the pleasure of good company and good music will be yours.he Friday, January 17th concert is something special. Khac Chi (pictured above) features two of Vietnam’s premiere musicians showcasing rare and unique musical instruments made from bamboo. The haunting lyricism, energetic rhythms and fascinating timbres of these instruments give the audience an intriguing glimpse into Vietnam’s rich musical traditions spanning some 4,000 years. Khac Chi concerts are an adventure in sound and alive with beautiful ethnic costumes. The duo have set out to bring their traditional music to western audiences in ways those audiences can appreciate and enjoy. This has meant creating lively new arrangements of traditional, folk, and contemporary tunes and using light-hearted stage antics to capture their listeners.